Color woodcut with silver pigment and embossing on paper; ōban. About forty percent of Hokuei’s known oeuvre depicts Rikan II who was a celebrity known for his versatility as well as his large, expressive eyes. 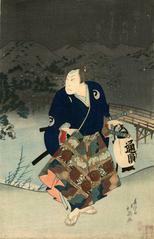 He acceded to the famed Rikan kabuki family name in1828. This short-statured actor with the nick-name “Metoku” [eye virtue] may have had no dance skills but excelled at both romantic male leads and the onnagata, or women’s roles. Trans. John Fiorillo, “Surimono-Style Prints by Hokuei,” Impressions. vol. 20 (1998): 64. There is another copy of this print in the collection of Cabinet d'arts graphiques des Musées d'art et d'histoire de Genève.